We offer multiple CNC Fast Wire or Fast Wire/Hot Wire machines capable of creating complex geometry / topography in three dimensions. CNC fast wire hot wire foam cutting machine. Three dimensional multiple axis CNC fast wire foam cutting machine capabilities. Abrasive wire foam cutting machine programming station control center. Three dimensional polypropylene foam shape. 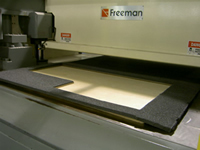 The latest in die cut technologies yield traditional die cut foam parts with consistent accuracy and reliable repeatability. 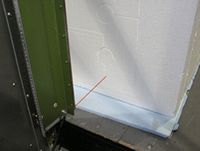 Die cut polyester polypropylene foam part. 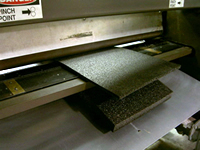 Foam rubber, foam plastics die cutting machine operator. Foam rubber, foam plastics die cutting machine. 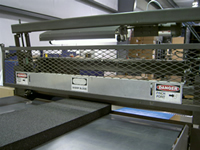 Steel rule die foam cutting press. Multiple cavity, multiple layer die cut foam part. 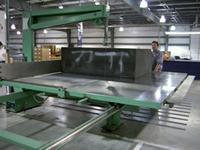 Large format saw operations make short work of large-scale material. 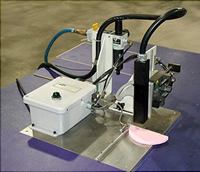 Band saw foam cutting operation. 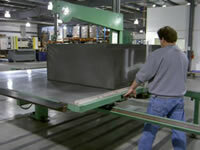 Large format foam cutting saw. 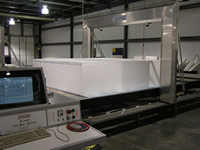 Splitting/sheeting services are available for a variety of foam types and densities. 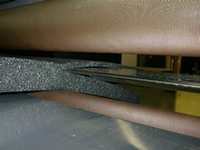 Foam splitter, slitter sheet rock foam sheeting. 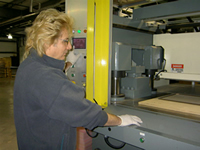 Gluing and laminating systems permanently bond material and combine various substrates. Hot melt glue adhesive machine. Foam Lamination multiple substrate hot melt glue station. 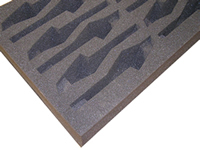 Multiple foam type three dimensional layer foam. 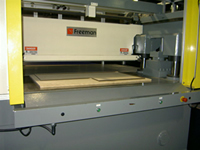 We can provide custom built machinery to suit most complex applications. 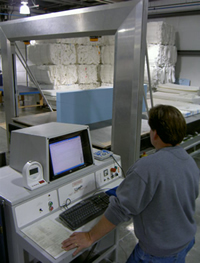 Complete systems can be designed to solve total production processes, from preliminary fabrication to package labeling and everything in between! Custom built foam fabrication machine solution ink jet printer.